Penelitian - With virtual reality (VR) sizzling in every electronic fair, there is a need for displays with higher resolution, frame rates and power efficiency. 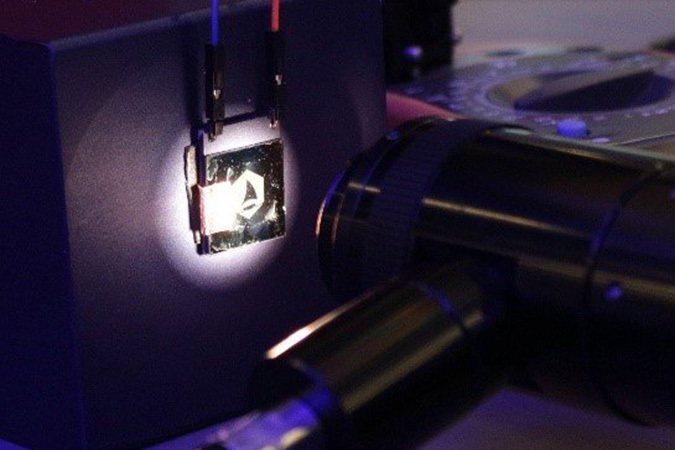 Now, a joint collaboration of researchers from SCALE Nanotech, Graphenea and TU Delft have used graphene to make reflective-type displays that operate faster and at much higher resolution than existing technologies. Displays consume the most power in electronic gadgets. Portable devices like smartphones and VR visors therefore require most of the energy from batteries. As an alternative solution, reflective-type displays (like those in e-book readers) consume little power, though they cannot deliver video. Reflective displays that offer the specifications of standard technologies (OLED, LCD) do not exist yet. The good news is that graphene makes this possible. Graphene, a monolayer of carbon atoms, is the thinnest, strongest material and the best electrical conductor, an ideal combination for micro-electromechanical systems (MEMS). Membranes in a graphene MEMS can be moved by applying an electric potential and, together with the large optical absorption of graphene (2.3 percent of visible light), the researchers used them to make a Graphene Interferometric MOdulator Display or simply GIMOD. "Graphene is a versatile material with excellent mechanical, optical and electrical properties, and the combination of all of them enables the GIMOD technology," says Samer Houri of the Delft University of Technology. "Measurements at TU Delft were sufficient to discover partially the potential of GIMOD pixels. We managed to characterize them up to 400 Hz, but we know they can reproduce the same color state at up to 2000 Hz," Houri says. Pixels in a GIMOD are electrically controlled membranes that modulate the white light from the environment. Humans cannot perceive flicker images beyond 500-1000Hz, but these displays beat the best commercial screens operating at 144Hz. Dr. Cartamil-Bueno, the inventor and researcher that fabricated the graphene displays, shares his experience as entrepreneur bringing the GIMOD technology to the market. "We showcased GIMOD prototypes of 2500 pixels per inch (ppi) in the Mobile World Congress, and many players from the display industry reacted quite enthusiastically," says Santiago J. Cartamil-Bueno of the SCALE Nanotech OÜ at Estonia. "While participating in several business contests in Germany, I have been preparing the team and securing capital. In few weeks, we will launch the startup to commercialize GIMOD components, aiming to tackle the VR market because that is where GIMOD outperforms every other technology," Cartamil-Bueno says. The graphene pixels that the researchers presented are 5µm in size, in contrast to those in the Apple iPhone X (55µm), Samsung Galaxy S9 (44µm), and Sony Xperia XZ Premium (31µm). "Our GIMOD prototypes would have a resolution of more than 12K if we make them the size of a smartphone display," says Cartamil-Bueno.